Ben G. Schachter is the Real Estate Broker and President of Quad Realty Investments, Inc. His role is particularly important to both the day-to-day operations of the company and the long range goals as set forth by the executive team. As the overseer of Quad’s 450+ person organization and 17 offices, he must ensure top down quality control for an extremely diverse organization. With intimate knowledge of the inner workings of each of Quad’s subsidiaries, Ben must make certain that there is a proper delegation of tasks and an effective management style to help promote the company’s successes on many levels. As an undergraduate at The University of Florida, Ben studied Political Science and gained valuable experience working a part-time Real Estate job in Gainsville. While working to upper management as an employee of a regional real estate organization in Alachua County, Ben quickly found that his education in the field was much more exciting than his education on campus, so he redirected his concentration away from law and began to focus much more seriously on the real estate industry. Upon graduation, Ben relocated to South Florida, where he became an integral part of his family’s mortgage banking business, as he helped the company grow to unprecedented levels. In addition to his work in the field of finance, Ben continued his real estate career and concentrated much of his efforts on the luxury and ultra-luxury new home and condominium market, selling properties throughout South Florida, Lee County and Volusia County, allowing him to develop experience working hands-on with clients from around the world, as investment in South Florida real estate became extremely popular in the early 2000’s. Additionally, Ben was able cultivate a firsthand knowledge of commercial real estate development as he was intimately involved with a mixed-use project in north-central Florida. In 2006, Ben joined Quad Realty Investments, Inc. and became the firm’s President. With a comprehensive background in real estate sales, mortgage finance, marketing and business development, Ben was a good fit for the organization, which had experienced little growth during the decade prior to his arrival. The organization quickly underwent tremendous operational change under Ben’s leadership, as he encouraged the Signature staff and its Sales Agents, having the company and all of its Sales Agents join the local Board of Realtors®, thus giving everyone Multiple Listing Service access. Initially, the company had four low-volume real estate offices inside or near of the four Century Village® communities. With the change in management, the company quickly began to flourish as it expanded into several other on-site real estate offices including: Boca West, Addison Reserve, Wynmoor in Coconut Creek, Gleneagles Country Club in Delray Beach, Wycliffe Country Club, Madison Green Country Club in Royal Palm Beach and Kings Point in Delray Beach. In addition to the extremely successful on-site real estate sales and leasing offices, Quad ventured into several other real estate related industries and Signature Title Group, LLC, an attorney-owned and operated title insurance company, Signature International Real Estate, LLC, a general practice real estate firm with Sales Agents all throughout South Florida and the Signature School of Real Estate, LLC, a fully-accredited real estate licensing and educational school. 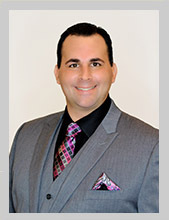 As a Licensed Florida Real Estate Broker, Licensed Florida Property Manager and a member of the Graduate Real Estate Instituted (GRI)®, Ben is always eager to further his professional education and to bring more knowledge to the firm and its valuable team players. Ben’s management style is one that has been well received by the Quad Family he takes a very hands-on approach to leadership and is always early to recognize the hard work and diligence of any of the firm’s spectacular team members. With unrivaled passion, a constant hunger for success, an unmatched support for his co-workers and an aggressive plan for growth, Ben is taking the company in a very positive direction, while achieving exceptional results on a continual basis within each of Quad’s subsidiaries. Unquestionably, the future of the firm remains extremely bright! Ben is a loving husband and proud father and lives in Boynton Beach with his wife Jodi, two son’s Max and Brody and daughter Sloane.